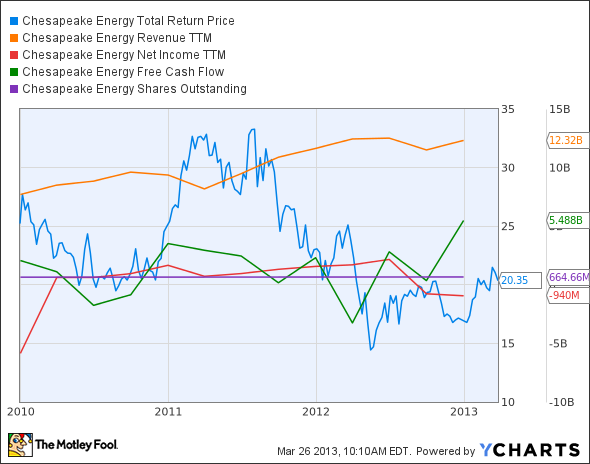 Is Chesapeake Energy Destined for Greatness? Investors love stocks that consistently beat the Street without getting ahead of their fundamentals and risking a meltdown. The best stocks offer sustainable market-beating gains, with robust and improving financial metrics that support strong price growth. 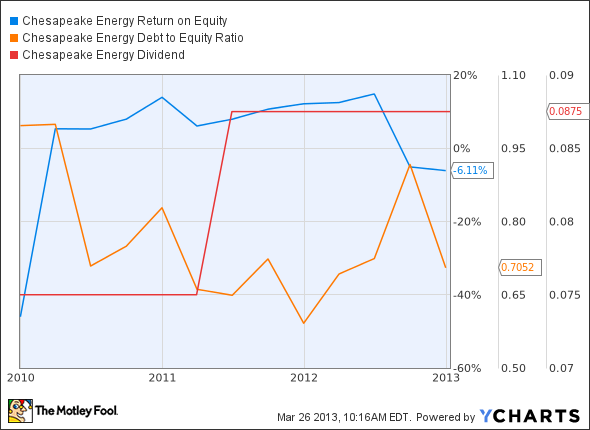 Does Chesapeake Energy fit the bill? Let's take a look at what its recent results tell us about its potential for future gains. Source: YCharts. * Period begins at end of Q4 2009. I have to admit to surprise at Chesapeake's near-flawless performance. With a free cash flow payout ratio this low, there's easily room to push the dividend higher and earn a perfect score -- but there are a few major roadblocks that might prevent Chesapeake from making progress on these metrics through the rest of 2013. Let's take a look at what Chesapeake faces this year as it struggles to regain profitability (positive momentum from a big 2009 hole notwithstanding). It's been half a year since I examined Chesapeake with two fellow Fools, and as the lone dissenter in our decision to place an outperform call on its stock, I've watched with some interest as Chesapeake's struggled to regain the ground it's lost since 2008. The company's planned asset sales were already well-known at the time, and those have pushed free cash flow up quite a bit in the latter half of 2012. This year, we've already seen Sinopec pick up some of Chesapeake's Mississippi Lime assets at fire-sale prices, which doesn't say much for either the value of the rest of Chesapeake's assets or for the wisdom of its earlier acquisition strategy. Further sales now run the risk of reversing cash flow gains as the company may need to divest its more productive assets. A sale of Marcellus Shale leases, as my fellow Fool Arjun Sreekumar points out, would fetch billions but could ultimately reduce total production by a fifth. The company's stake in leading nat-gas fueling infrastructure company Clean Energy Fuels is also on the block, and over the past three years shares in that company have (with a few spiky exceptions) been slowly moving lower as well. This is on the heels of a divestiture of Chesapeake's shares of Access Midstream Partners , which would have been one of Chesapeake's rare successful investments if it had held on -- it's up nearly 50% in the past year. So what's next? Embattled CEO Aubrey McClendon is out. Chesapeake has been pushing hard to get away from a nat-gas focus, but that may not be quite so necessary any longer. In the past year, the United States Natural Gas Fund is up 22%, which is the first trailing 52-week period (March through March) in which it's gained since its inception. Granted, the fund is down 95% from inception, but what goes down must (at least in theory) come back up. Chesapeake has been moving in the right direction after a dangerous overexpansion, but now it's got to hold on and hope for higher prices. Today, Chesapeake has many of the qualities that make up a great stock, but no stock is truly perfect. Digging deeper can help you uncover the answers you need to make a great buy -- or to stay away from a stock that's going nowhere. The article Is Chesapeake Energy Destined for Greatness? originally appeared on Fool.com. Fool contributor Alex Planes holds no financial position in any company mentioned here. Add him on Google+ or follow him on Twitter @TMFBiggles for more insight into markets, history, and technology.The Motley Fool recommends Clean Energy Fuels. The Motley Fool has the following options: Long Jan 2014 $20 Calls on Chesapeake Energy, Long Jan 2014 $30 Calls on Chesapeake Energy, and Short Jan 2014 $15 Puts on Chesapeake Energy. Try any of our Foolish newsletter services free for 30 days. We Fools may not all hold the same opinions, but we all believe that considering a diverse range of insights makes us better investors. The Motley Fool has a disclosure policy.